I'm going to be in Saskatoon, Saskatchewan this week presenting some sessions on big band drumming at the the annual Saskatchewan Music Educators convention so there won't be any updates here until I get back next week. Thanks to Mark Griffiths from soggy New Jersey who hipped me to this gem. According to Mark this album, for guitarists, is the equivalent of the Bill Evans trio meets Miles' Plugged Nickel sessions! Apparently the unreleased tracks from the gigs will soon see the light of day and I'll be sure to grab them when they do. Thanks again for your support and see you all next week! 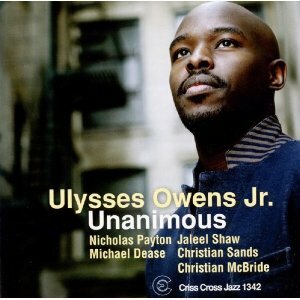 Up Close with Ulysses Owens Jr.
Owens latest album on the Criss Cross label "Unanimous" has actually been making the rounds on my car's CD player for the past few months and I've really been digging his playing and hard swinging concept. I've heard via Christian McBrides Facebook feed that he's recently recorded new quintet and trio albums to be released in the new year. I'm definitely looking forward to checking those out! Well, I'm a little late today but its been a crazy day and this is the first chance I've had to sit at my computer and share these random and yet awesome things with you all today. It's interesting how Connie Kay doesn't get mentioned all that often. 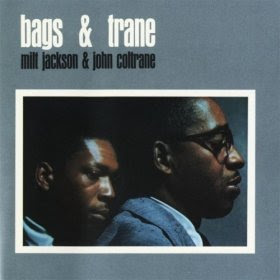 His playing on the album "Bags & Trane" featuring Milt Jackson and John Coltrane is one of my personal favorites. -I've really been digging Ralph Peterson Jr.'s album with his Unity Project of late. Here's some in-studio footage of a duet between and organist Pat Bianchi to check out. Dig those brushes! 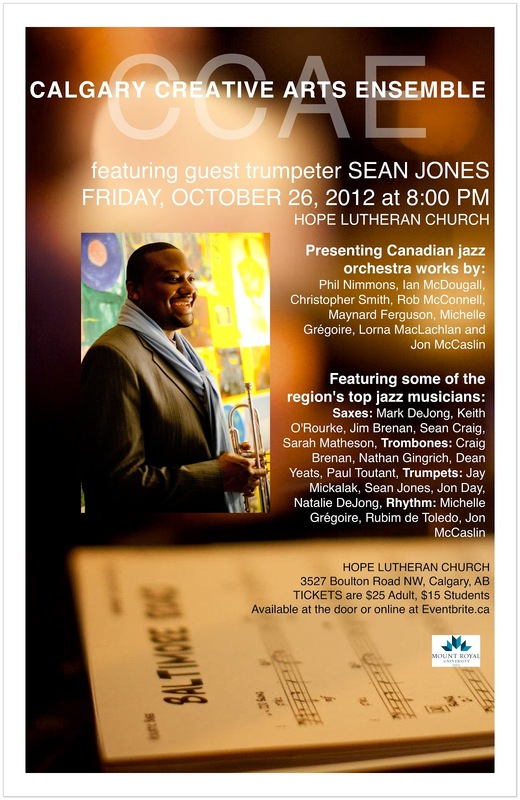 The Calgary Creative Arts Ensemble is in full force presenting its third concert of 2012 featuring American trumpeter Sean Jones. This concert will feature jazz orchestra music penned by local and international composers performed by the crème of the region's jazz musicians, a 16 piece big band comprised of performers such as Mark DeJong, Jon McCaslin, Michelle Grégoire, Jim Brenan, Jon Day and many more. Sean Jones is particularly adept at plumbing complex emotional depths through his trumpet playing and composing. As Jones says, “I like to play from the heart and not the head.” In the spring of 2010 he stepped down from his position as Lead Trumpeter of Wynton Marsalis’ Jazz at Lincoln Center Orchestra, a position that Jones held for over half a decade. He recently recorded his sixth record as a leader and has performed and toured with artists such as Marcus Miller, Wayne Shorter and Herbie Hancock. 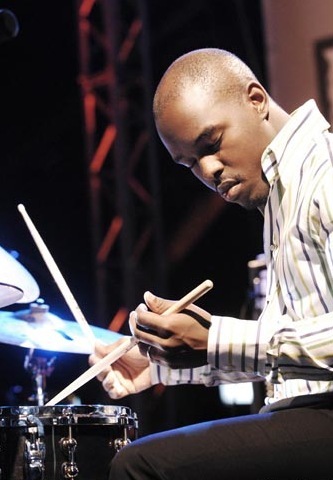 For more information on Sean Jones please visit http://seanjonesmusic.com/. Sean Jones' appearance is sponsored by Mount Royal University. Jones is Mount Royal Jazz Music Program's 2012 Visiting Artist In Residence. In addition to his appearance with the CCAE, Jones will be working with MRU students from October 22-25, and presenting workshops open to the public on October 26. All public workshops are on campus. The CCAE concert program on October 26th will include works by Canadian composers Phil Nimmons (Toronto), Ian McDougall (Victoria), Christopher Smith (Montréal), Rob McConnell (Toronto), Maynard Ferguson (Montréal), Michelle Grégoire (Calgary), as well as premieres of works by local composers Lorna MacLachlan and Jon McCaslin. Calgary has a diverse and active music scene, and the Calgary Creative Arts Ensemble (CCAE) works to enrich and energize the musical environment by engaging Calgary's most active, creative, and interesting jazz and improvising musicians to create original music for large jazz ensemble of the highest calibre. 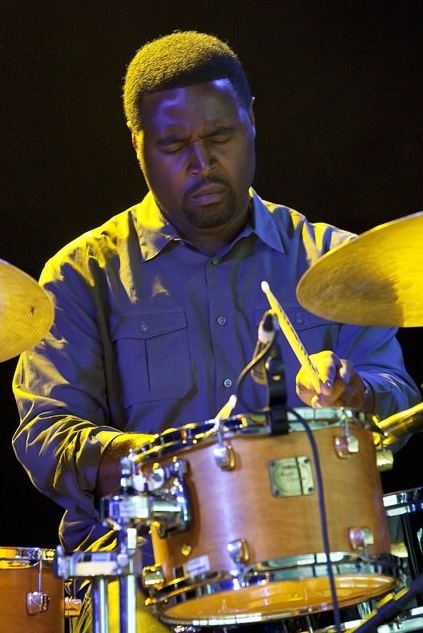 While many Calgary musicians have risen to prominence in a variety of genres and musical settings, there are numerous improvising and creative jazz musicians who deserve a higher profile on the local, regional and national level. The CCAE was created by and is run by the The Liftoff Collective, a collective of three musicians namely saxophonist Mark DeJong, drummer Jon McCaslin, and pianist Michelle Grégoire. These Calgary based jazz artists share a common passion for the creation and performance of original Canadian repertoire for large jazz ensemble. Sensing a need in the Calgary community for an ensemble with this type of focus, these accomplished musicians set out to form The Calgary Creative Arts Ensemble. For more information and detailed biographies on the guest artists as well as featured composers, please contact Michelle Grégoire at (403)-228-1175, michjazz@gmail.com. 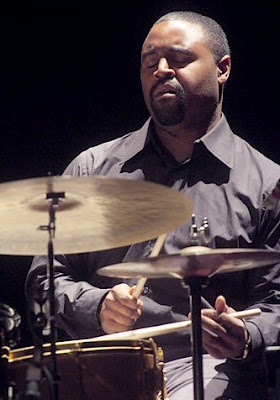 For more information on Sean Jones (picture, bios, sound samples) please visit http://seanjonesmusic.com/. Thank you Chad Anderson for the muse and Joe LaBarbera for some insightful and humbling recent commentary on my left foot hi-hat technique! Thanks to Edmonton's Efa Etoroma Jr. who posted this one via the Facebook. A couple of weekends ago while I was performing with the Tom Van Seters Quintet up at the Yardbird Suite in Edmonton, Alberta (by far one of Canada's BEST Jazz clubs - Period) my good friend and saxophonist Jeremiah McDade asked me about a particular pattern that I played during some extended vamp-like 3/4 sections of Tom's compositions. 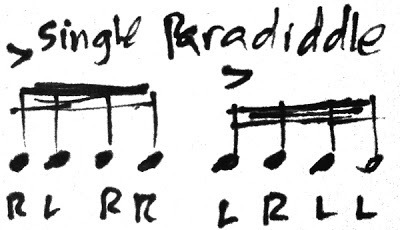 If you'll recall, David Braid asked me a similar question last summer with regards to another pattern in 12/8 that I like to play, but this particular one is quite different. I've written this in 6/8 but it's obviously interchangeable in 3/4 as well. Admittedly, I was inspired to come up with a pattern like this from listening to Jeff Ballard come up with his own interesting 6/8 and 12/8 variations. You'll notice that the bass drum playing dotted quarter notes really reinforces the phrasing of the cymbal rhythm with the right hand. Now, if you break down just what the hands are doing, to me it resembles some sort of Swiss Army Triplet but given where the flam and accents lie, it's not a straight forward Swiss Army Triplet. As best as I can tell, I would call this an "Inverted" Swiss Army Triplet. It's got an interesting feel to it and when you put it together it gives the overall drum set pattern some really interesting layers. My only regret is that I didn't bring my cowbell with me to Edmonton as I think these patterns would lend themselves well to a cowbell part. Happy Birthday to one of my biggest drumming heroes, Art Blakey! 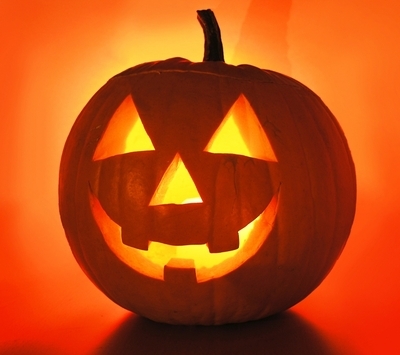 Bu was born on October 11, 1919 and would have been 93 years old today! I usually post these things on Monday mornings but seeing as yesterday was Canadian Thanksgiving today is in fact the de facto beginning to the week. Last week was a very busy and exciting week of music for me. Monday started off with a bang performing the music from Charlie Parker's "Bird with Strings" album at the University of Calgary featuring Washington D.C. saxophonist Vaughn Ambrose and a full string section. It's not often I get to set up next to the harpist (and I thought that I had a tough load-in sometimes!) Wednesday evening I was at the Cliff Bungalow-Mission Jazz Series (curated by Jan Mulder) and presented the music from Pat Metheny's seminal 70s ECM album "Bright Size Life" with guitarist Ralf Buschmeyer and bassist Dale James. I had a fun time checking out Bob Moses' drumming to get me ready and man, that's some tough music! This past weekend took me up to Edmonton and I played the Yardbird Suite on Friday night with trumpeter Doug Berner's group and then Saturday evening with the Tom Van Seters Quintet. Never a dull moment for me these days and I'm very thankful to have the opportunity to play with so many talented and dedicated musicians on a regular basis. I really dig how he cleverly dances around his rock-solid quarter pulse on the ride cymbal. He also plays with an incredible sense of space and dynamics. -Who wants press rolls? Do you want press rolls? Okay, Jason Marsalis has some press rolls for you! 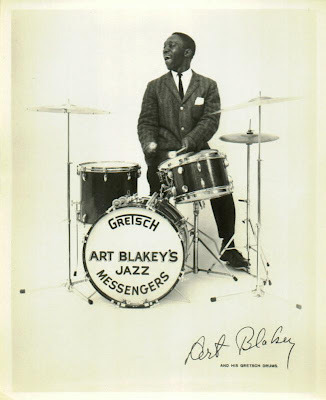 As Jesse points out in his earlier post, check out Master Roy Haynes in this footage and it's all there! 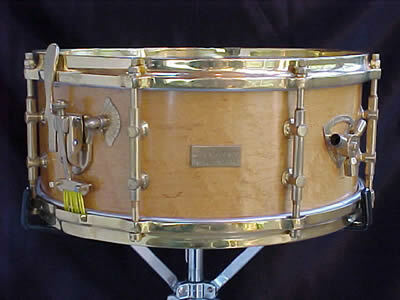 A good friend of mine recently purchased a couple of very special Billy Gladstone snare drums and let me tell you, they are very special indeed!